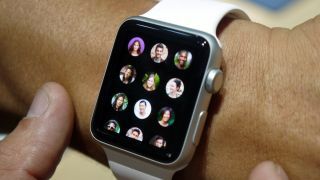 Bad news for Apple Watch hopefuls? For how long will the Apple Watch be able to do this? Since as early as last September, there have been rumors about the Apple Watch's battery life, with the most pessimistic alleging that you'll have to charge it every night. That would have been a pain, but with the latest report it seems it may be even worse than that: according to 9 to 5 Mac Apple is targeting just 2.5 to 3.5 hours of heavy to standard app use on a single charge. With Apple's current expectations the Watch's fitness apps can reportedly go four hours without it needing a recharge, while the actual clock face can stay displayed for a total of three hours. And ideally the Apple Watch will be able to stay in standby or sleep modes for anywhere from two to four days. It's important to keep in mind that these are simply Apple's targets - and besides, it's unlikely anyone with an Apple Watch will spend anywhere near three hours a day staring at the wearable's ticking clock face. But only a few hours of application use doesn't seem so hot. The report says the Apple Watch's S1 chip is roughly equivalent to the current-gen iPod Touch's A5 chip in power, and its screen is capable of display 60 frames per second, which means some advanced and battery-intensive apps and games are possible and even likely to show up on the device. Remember too, though, that these are simply Apple's goals for the company's very first smartwatch, and if they don't improve in the first-gen product then they definitely will with subsequent iterations.